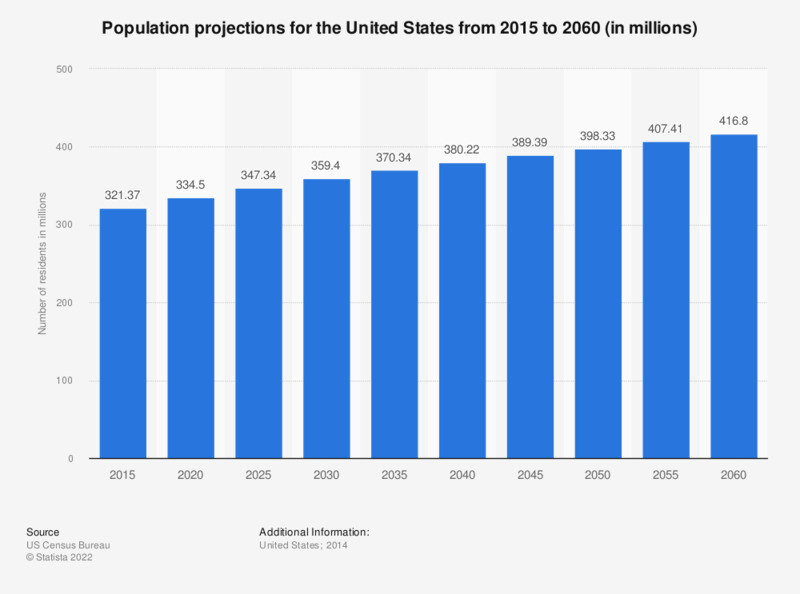 This graph shows population projections for the United States of America. The estimated population of the USA in 2050 is 398 million residents. The U.S. Census Bureau presents annual projections for the growth of the U.S. population up to the year 2060. By 2050, it is estimated that the American population will surpass 398 million citizens. The U.S. census also projects a regressing annual growth rate, starting at 0.8 percent in 2015 and decreasing to 0.46 percent by 2060. The UN population division publishes population projections for the entire world up to the year 2100. The United Nations also projects a regressing annual growth rate of the world population. Between 2015 and 2020, the population is expected to increase by 1.04 percent annually. Around 2060, the annual growth rate will have decreased to 0.34 percent.